We now have 39 Lightning Ridge Engravable Western Trophy Buckle available. These econonical buckles are very fine quality and are manufatcured by the Crumrine Buckle Company. These buckles are silver and gold in color and are made of 94% zinc and 6% aluminum. These Engravable Western Trophy Buckle include free custom engraving if required at no additional charge. That's right there is no additional charge for custom engraving of these buckles. Engraving is in black, deep block capital lettering. These are the most economical custom buckles that we have available. Plus each of these fine quality trophy belt buckles come gift boxed. 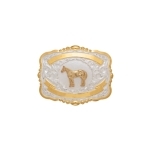 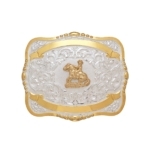 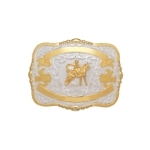 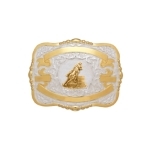 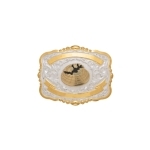 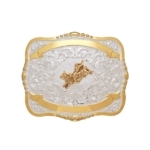 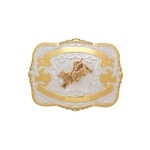 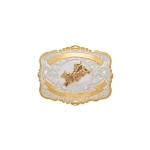 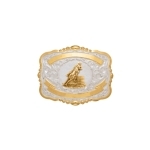 These buckles are a great and economical choce for your rodeo awards, 4 H club or as a commerative gift. They can even be used as a groomsman gift for your wedding. 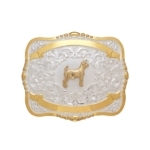 Delivery time is fast on these buckles too, usually less than 3-4 weeks.